TRUMPower and Tumbler Technologies has introduced a new addition to its AC/DC switching power supply line-up with the TTM210 series, which is comprehensively approved to industrial and medical standards. The series is able to deliver 210W of continuous output power at 11CFM forced air or 160W at convection cooling. It comes as an open frame PCB in a low profile 5″ (L) x 3″ (W) x 1.5″ (H) package and has an active efficiency of 88% typically at full load. The power supply offers 2 MOPP between input and output and 1 MOPP between input and ground. The series can withstand voltages of 4,000VAC from input to output, 1,500VAC from input to ground, and 1,500VAC from output to ground. 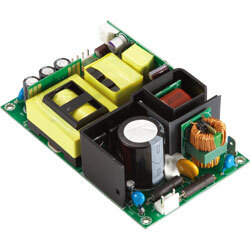 The series includes three standard models of single 12V, 24V, or 48V power supplies each with an actual earth leakage current measuring 100µA maximum at 264VAC, 63Hz.